Experimental tests have proved that, in the case of shooting in the snow, SNP25, explosive medium-low speed is more effective than those at high speed like TNT. 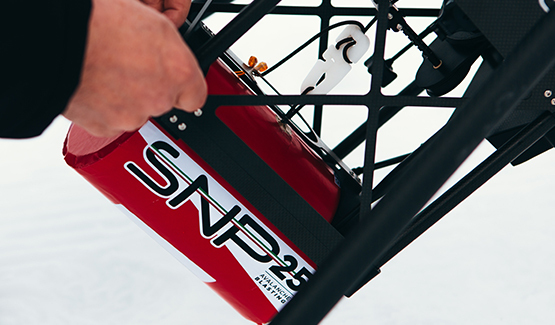 Working at a lower speed, but for a practically double application time, SNP25 can exert greater pressure on the snow surface, thereby doubling the destabilizing effectiveness on the snow cover. 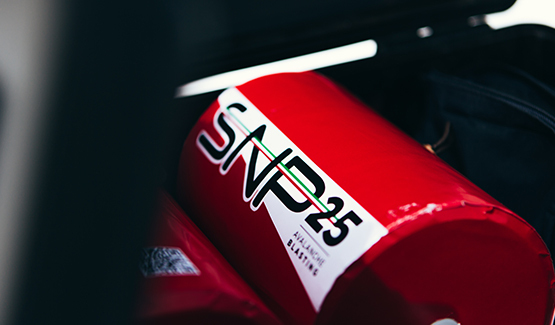 SNP25 charge is delivered ready to use, ready-made in the optimal shape and dimensions. SNP25, in addition to being available in a very short time, can be both stocked in small amounts after notification to the local office of Public Security and stocked in specific deposits, all without danger for Security. In this way, unlike traditional systems, it is assured the immediacy of intervention when it is necessary. SNP25 product cannot have sympathetic detonation and does not have problems related to low temperatures, common in high mountain in Winter period. The device is equipped with various safety systems in order to prevent the charge from being accidentally turned on and allow the operator to walk away safety. SNP25 and SNP25-A, the weakened version designed for practice exercises, are CE certified products. To handle the SNP25 it is necessary to pass the Exam for the assessment of the technical capacity for the execution of explosives operator activity and to get the suitability certificate. As an alternative, it is necessary to have the suitability of fireworks lighting issued by the competent Prefecture after have made a specific exam. Moreover, ATM Srl, creator and producer of SNIPER System, recommend a discretionary Training Course of 2+1 days. During these days it is set the right working procedure, shared between the involved figures as shown in the checklists, with the aim to form jointly the Blasting Team.